The Fig Leaf. Edible and Insulin Lowering. Frankly, I didn’t even know you could eat a fig leaf. 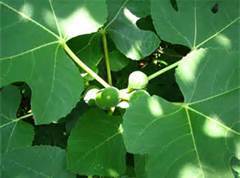 While I love the fruit of the fig tree, I find the leaf itself rather prickly. You can also dry them to use as a tea. Apparently it’s delicious, but I haven’t tried it myself as of yet. This entry was posted in Facts, What's in the Kitchen? and tagged diabetes, diabetic, fig leaf, fig recipes, fig tea, fig tree, food, health, insulin lowering, insulin response. Bookmark the permalink.